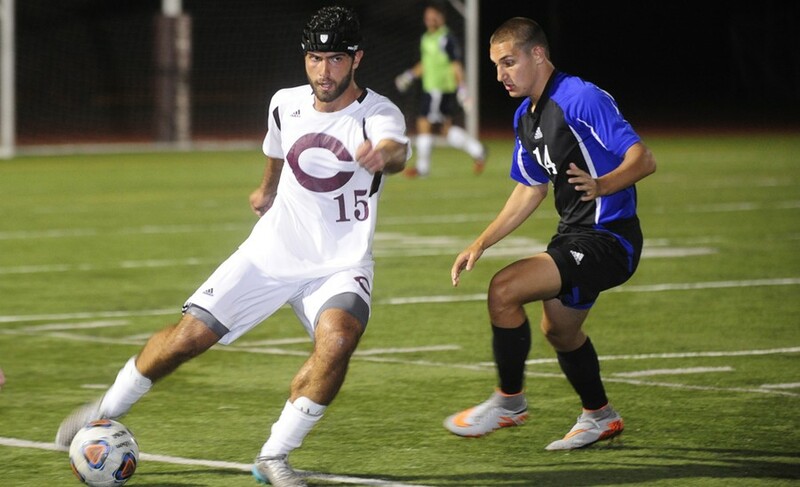 George Voulgaris looks to pass the ball to a teammate as he attempts to protect the ball from a defender. After a long summer leading up to a highly anticipated season, Chicago kicked off the season with a bang on a sunny Thursday afternoon on Stagg Field. With the season beginning on September 1, the Maroons posted their best season-opening offensive performance in the past 10 years with a 4–0 win against Dominican University. This was just the beginning of a 10-game winning streak that is still standing untouched. Following the stellar shutout victory courtesy of third-year goalkeeper Hill Bonin, the Chicago men pulled through a penalty-riddled match with a 1–0 triumph in overtime. Third-year Andre Abedian proved to be the MVP of this match as he converted on a one-on-one situation, burying the goal effortlessly. Abedian came in clutch once again the following Wednesday when he kicked in another vital goal to secure a win against Knox College following long delays due to harsh weather conditions. The squad also got a massive scoring punch from its young first-year class in tandem with stellar defensive play during a 3–0 win at North Park University on Friday, September 9. First-year Dayo Adeosun scored the first two goals of the game with assists from fellow first-year David McBroom. The nationally fourth-ranked Maroons (5–0 record) finished their game on Tuesday, September 13, with their fifth straight shutout, the longest in UChicago history. They beat Wheaton College with almost perfect defense and an impressive offensive performance. After falling behind by one goal against Elmhurst, the team came soaring from behind to win 4–1 on September 16. McBroom erased the team’s deficit and was followed by another first-year goal, this time courtesy of Sam Drablos, who also gained an assist on the third goal of the game as well. Following Friday’s victory, second-year Max Lopez came to impress as he supplied his team with a hat trick in the second half of the game, which was all that was necessary to pull off the victory against Wartburg. The Maroon men finished off the last three games of their preseason with a 4–0 win against North Central Illinois, a 2–0 victory against Rose-Hulman, and a 6–2 triumph over No. 19 Carthage College. They ended their streak of pre-class games with a stellar 10–0 record. Fourth-year Chris Mathis also pitched in on what he thinks is important to maintain as the season blows into full force. “Maintaining a high level of intensity in training and in games is something that I work on improving every day. While it’s difficult at times to stay focused, it is vitally important to be ready at a moment’s notice when your time to play comes. Off the field, I and the rest of the seniors and upperclassmen make a concerted effort to cultivate the team’s culture,” he said. The team heads to Atlanta, GA, this weekend to take on Emory in its first conference match of the season. The game begins at 1:30 p.m. on Saturday.